Pupils from Park End Primary School in Middlesbrough will mark World Book Day by taking a literacy-themed train journey to York, where they’ll see Tim Peake’s historic space capsule at the National Railway Museum. Thanks to our partnership with Grand Central Rail, Year 5 pupils will board a train at Eaglescliffe on Tuesday 6 March. In support of the Middlesbrough Reads campaign, pupils will receive free space-themed books to encourage reading for pleasure during the journey and take part in quizzes and activities about space, a topic they have been learning about this term. When they arrive at the National Railway Museum, the class will come face-to-face with the impressive spacecraft that transported Tim Peake back to Earth after his visit to the International Space Station in December 2015. This is the second year that we've celebrated World Book Day with Grand Central. 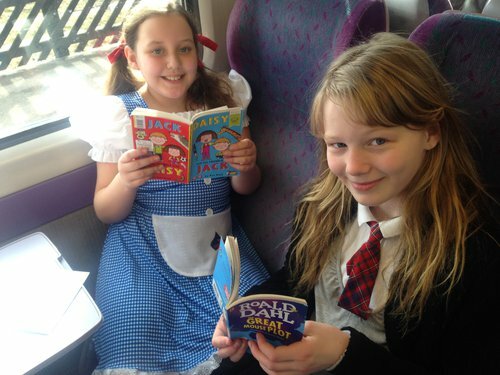 In 2017, pupils from The Avenue Primary School enjoyed a Where’s Wally?-themed rail journey to York. The National Literacy Trust Hub in Middlesbrough, which was re-branded as Middlesbrough Reads this year, brings together a range of partners to promote reading and improve literacy levels in the town. Established in 2013, successes to date include an award-winning project to encourage parents of premature babies to read to their children, and improvements in early years attainment after running the National Literacy Trust’s Early Words Together programme. As part of World Book Day, every pupil in Middlesbrough received a special £1 book token, which can be exchanged for a World Book Day book or be used to get £1 off a full price book. This year’s 10 titles include Oi Goat! by Kes Gray, Brain Freeze by Tom Fletcher and The Girl Who Thought She Was A Dog by Clare Balding. Middlesbrough Reads also gifted an additional 100 £1 books to NEPACS, a charity that supports the families of prisoners in the North East. At Park End Primary School, this year’s chosen World Book Day book is The Day The Crayons Quit – a story which ends in the black crayon being used to draw a penguin. Staff at the school are dressing up as crayons for the day, with one teacher wearing a full penguin outfit. Coincidentally, after Year 2 pupils wrote a persuasive letting to the school’s head teacher asking if they could adopt a real penguin, this was approved and finalised last week. Find out more about Middlesbrough Reads.